Top 17 fascinating facts about rhinos - how many do you know already? Rhinos are one of the most iconic animals in the world, yet many people do not know a great deal about this ancient species. We have brought together 17 of the most interesting facts about rhinos that we could find to fill this gap in knowledge! The word “rhinoceros” comes from the Greek words “rhino” (which means “nose”) and “ceros” (which means “horn”). Literally translated therefore, rhinoceros means nose horn. There are now five different species of rhino in the world. Two of these are native to Africa – the Black Rhinoceros and the White Rhinoceros – and three of these are native to Asia – the Indian Rhinoceros,Javan Rhinoceros and Sumatran Rhinoceros. The Black Rhinoceros, Javan Rhinoceros and Sumatran Rhinoceros are all listed as Critically Endangered – this means that they have a 50% chance of becoming extinct in the next three generations. All five rhino species can grow to weigh over 1000kg, with the white rhino reaching a staggering 3500kg! This makes the white rhino the second largest mammal after the elephant. Relative to their large body size, rhinoceros have small brains. This does not mean that you should underestimate their intelligence however! Rhino horns are made from a protein called keratin, the same substance that hair and fingernails are made of. 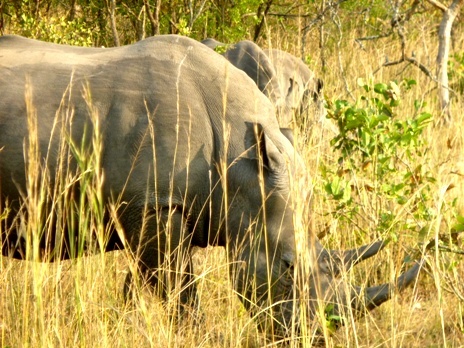 Contrary to popular belief, the rhino’s horn is not bone (it is not even attached to the skull). The horn is actually made of masses of hairs that are all compacted in together. These hairs grow throughout the rhino’s lifetime, just like our own nails and hair do. The longest recorded rhino horn was an amazing 4 feet 9 inches long! If the horn falls off, another will grow in its place. A group of rhinos is called a ‘herd’ – or a ‘crash’. Ever seen a white White Rhinoceros? Us either. Despite the misleading name, all white rhinos are actually grey. Rhinos can grow to be over 6 feet tall and more than 11 feet in length – that is big! Can you guess the closest living “relatives” to the rhino? Surprisingly, these are horses, zebra and tapirs. They all belong to a group of mammals called odd-toed ungulates. Despite their weight and their bulk, rhinos move fast! They can run up to 30 – 40 miles per hour. To put that in context, Usain bolt can run 28 miles per hour. 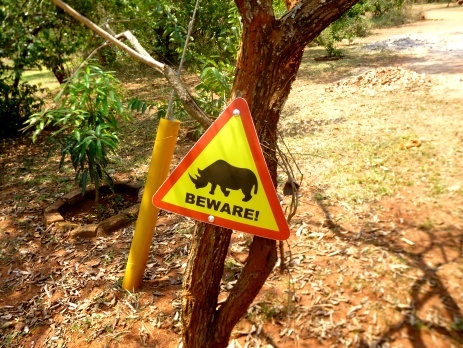 Now imagine a rhino sprinting at you at that speed! Mother rhinos are pregnant for a total duration of 15 – 16 months! Rhinos have very poor eyesight, but this is more than made up for by their other senses. A rhino would have great difficulty seeing someone standing just 30 metres away if they weren’t moving. If the person moves, makes a sound or can even be smelled by the rhino however, it will easily detect that person, even at much greater distances. 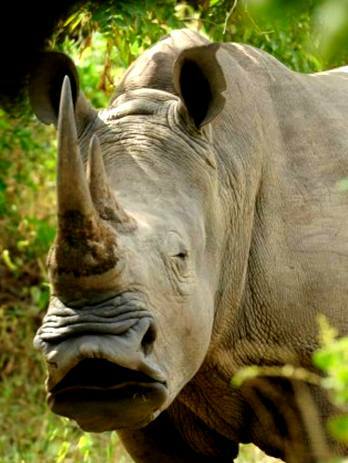 African rhinos and oxpeckers (a type of bird) have a fascinating symbiotic relationship. The oxpecker stands on the rhino’s back and eats ticks and other insects that it finds on the rhino. If the oxpecker senses danger, it will always create a commotion, which helps to alert the rhino to it as well. How do you think that rhinos communicate with other rhinos? Interestingly, it is through their dung. Each rhino’s dung has a unique smell, and identifies its owner. From rhino poo you can also tell if that rhino is young or old, male or female. Dung is quite useful for marking a rhino’s territory too, just like dogs like to do. Rhino’s communicate by doing a poo! Rhinos are ancient, having been around for over 50 million years. Rhinos were much woollier in the prehistoric times, but otherwise they have not evolved much. The only changes that have been identified are that some of the first rhinos didn’t have horns, and that some rhino species actually roamed North America and Europe. No rhino species have ever inhabited the South American or Australian continents. Black rhinos seem to enjoy a scrap, especially amongst themselves. Black rhinos have the highest rate of death among mammals in fights among the same species. 50% of males and 30% of females die from these intra-species fights. There were once “woolly rhinos” that walked the Earth in prehistoric times, when the average temperature was much lower. It is thought that they died out about 10,000 years ago thanks to a combination of human hunting and dramatic climate change. If you like rhinos and enjoyed our facts about rhinos, you might like our rhino conservation volunteering page.